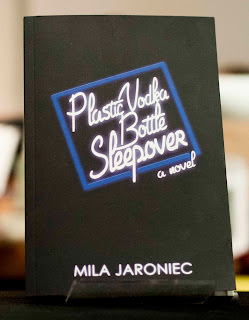 A Saturday morning is the perfect time to finish Plastic Vodka Bottle Sleepover, the new novel by Mila Jaroniec, because you have the whole day to be upset that it's over. I found myself turning a page this morning, hoping to gorge myself on more of Jaroniec's painterly, poetic prose, often inspired by ecstatic prose writers like Michelle Tea and Jack Kerouac, only to find that I had finished the book. I would be lying if I did not say a beat of despair pulsed through my chest, then dissipated. Described by essayist Chloe Caldwell as "deceptively slim," Plastic Vodka Bottle Sleepover's mere 127 pages are bursting with a revelatory, soul-plunging, image-rich, non-linear narrative and it's almost mind-boggling how Jaroniec has been able to pack so much into a small space. Throughout PVBS, we travel with Jaroniec's nameless narrator as she navigates New York as a young queer woman, her days and nights out with too-open-hearted-for-her-own-good best friend Mischa alongside lovers detached, invested or both, and chemicals of all varieties pouring through their bloodstreams. Told in a series of portraits that either anticipate the future, flash back to the past, or get lost in the present, they describe not just single moments, but the depth with which the narrator experiences them. Much like the book Hopscotch by Julio Cortázar which appears and is referenced periodically in its pages, Jaroniec's book too can be read in and out of order, the strength of each portrait making it stand alone and as a part of a whole. "My body looked blue in the melancholy daylight, equal parts ethereal and run-through, Cimabue's Madonna. The cool-eyed blue of a holy streetwalker taking of her wig after a long night, russet, blonde, whatever color the john preferred, not the half-trusting Pretty Woman with the apple pie smile but a beat woman, a Beat Madonna, howling Courtney on her knees dripping manifestos and mascara, underworld saint-girl and her web of synthetics between he world and those threads of blue veins. All the holy women were blue." Her feelings are palpable and poetic. "The woman beside me is crunching her way though a box of chicken nuggets….these resonate with such a deliberate, infernal crack that it makes me wonder if even she is thinking about it, if at this moment she is taking it as a warning that her food is making such an unnatural sound. I picture the lipid molecules, microscopic grease balls floating around in her viscera, and think about the word, lipid, how the object recalls the sound, banana-shaped fat deposits emergency yellow on either side of a dissected frog." The book is filled with kind of prose one can appreciate not just as a reader but as a writer, its assemblages of words inspiring and writer's-block-loosening, relieving one of that miserable mental sloshing-through of molasses or cement to produce a phrase or passage that moves oneself forward. There are lines in it I imagined reading aloud to others as poetry. Sitting, reading on the train, I wanted to speak them to everyone. Instead, I heard them in my own head and they were still magic, an incantation imbuing the world with more beauty than it had before I started reading. 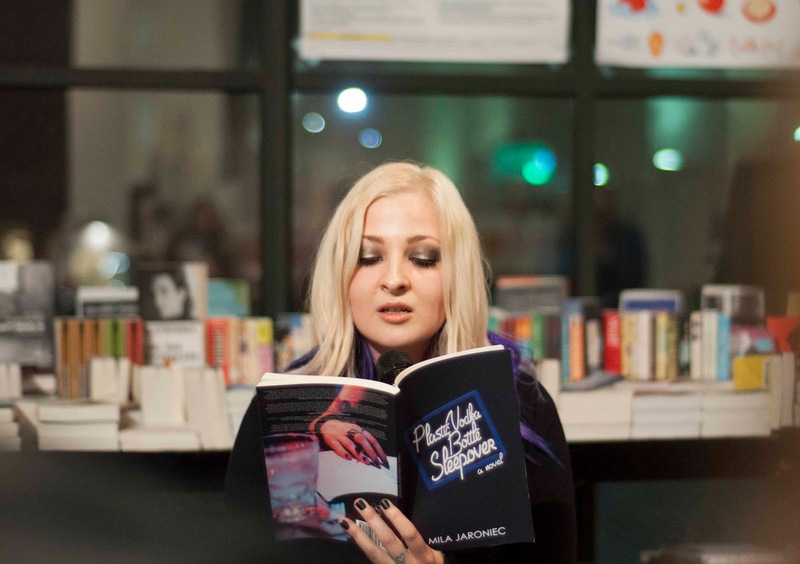 This past Tuesday I went to the Plastic Vodka Bottle Sleepover launch party at powerHouse Books in Dumbo. I have been acquainted with Mila Jaroniec for several years by this point, always entranced by her thoughtful, powerful prose, while never knowing her all that well. The first time I met her her eyes were painted an electric blue, the color of the beings in that Avatar movie I've never seen, in what I've now learned was an Urban Decay eyeshadow called Radium. The second time her lids bore a coating of Astroturf-like green. I was intimidated not just by her devastatingly good skill with eye makeup, but by the MFA she was working toward in fiction at The New School. She sat regally on a couch, blonde hair underlaid with a bold gash of turquoise, philosophy and literature spilling from her mouth. A black sweater, dress and tights covered her many tattoos. She had seen much more of the world than I had, lighting cigarettes that filled her friend's apartment with a tobacco scent and world-weary intellectualism. But she wasn't unwilling to share her experiences, exhaling smoke with tales of writing workshops and former lovers. What a rad gal, I thought to myself. I would see her periodically and always enjoyed conversations with her, thinking of her when writing opportunities arose and having her read twice at Miss Manhattan. 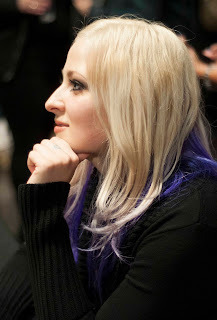 Tonight Mila's eyes are a lavender-y chrome color and her hair is blonde underlaid with bright purple. Visiting Brooklyn for a few days, she lives in Ohio now and has a four-month old baby named Silas. Copies of her book are on display in the store, and she offers as party favors minibar-size bottles of vodka emblazoned with her book cover and name instead of their original logo. She reads from sections of the book I had not gotten to yet and the words jump off of the page and into my imagination with such speed that I feel like I have done the cocaine she is reading about. I know this woman only a little, but I am so proud of her. Mila, it is my promise to you that I will always share your work whenever I can. The world needs as much beauty as it can get. Plastic Vodka Bottle Sleepover, $16, is available from Split-Lip Press here.